ntries when people remembered those who lost their lives in 2 World Wars and many other tragic conflicts. 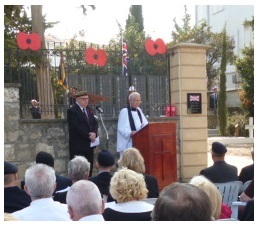 In North Cyprus, at the Old British Cemetery in Kyrenia, there was a huge gathering of people to remember those who did not return home, not only in the many conflicts over the years but especially for the 371 British servicemen who lost their lives in Cyprus at the time of EOKA and the quest for Enosis (Union with Greece). 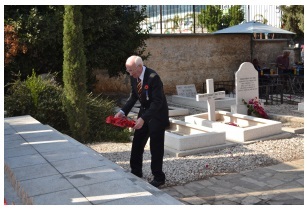 he British servicemen who lost their lives in Cyprus. He said that in Afghanistan between the years 2001 and 2013 (12 years) there have been 445 British servicemen who have lost their lives. 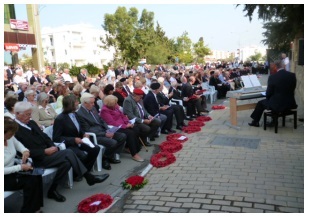 In Cyprus between the years 1955 and 1959 (4 years) there were 371 British servicemen who lost their lives. By my calculation, a very heavy toll which deserves recognition. e to pay their respects. The service was conducted by Lt. Cdr. the Reverend John Davies who spoke of his own experiences in areas of conflict, as well as referring to some of the servicemen who had died in the Cyprus Emergency and the fact that Greeks and Turks were also killed at this time. Rev. Davies also referred to the 4000 servicemen who had been killed since 1945 and that 1968 is the only year when a member of the British Forces did not lose his/her life. He also mentioned the servicemen who had been badly injured and would carry the scars of war for the rest of their lives. 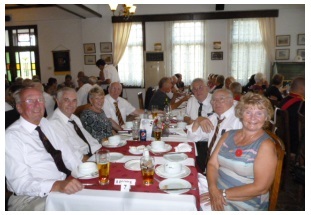 The Kyrenia Branch of The Royal British Legion is the youngest and fastest growing Branch and also has the oldest member, Peggy McAlpine, who recently achieved the age of 106 years. 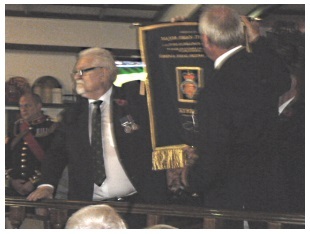 The Exhortation was given by Mr Keith Lloyd and also the Kohima Epitaph. There were hymns and prayers and there followed a very emotional time for the veterans who then laid wreaths on behalf of their respective regiments. y Memories in Cyprus 1958-59 – click here. ked so hard and we all enjoyed an excellent 3-course lunch which was delicious. After the lunch there was a sing-song with some of the real old-time favourites and everyone joined in, even if they did not know all of the words. After the lunch everyone made their way home after what was a very poignant but enjoyable day. There is a lot of history attached to the Old British Cemetery and this can be viewed in previous articles about Sergeant Samuel McGaw VC click here and also about the Newman family of Newman’s Farm (soon to be updated) click here. The following day arrangements were in hand for Chris and I to take 3 of the ex-servicemen and a Turkish Cypriot friend who is based in the UK, to Wayne’s Keep in the Buffer Zone and this will be the concept of another article giving an account of yet another memorable experience. I have just discovered this, and I really must say that you have captured all of the emotions and Ceremony of a day that I will remember for the rest of my life! Makes me feel that I should really be doing more for the Branch! Thank you for your comment. If you have not already seen it, you may enjoy reading an article I wrote last year about a British ex-serviceman’s time in Cyprus in 1957/59. The link is http://cyprusscene.com/2013/04/21/16911/ This has been very popular with over 1,000 reads. I am sure RBL would welcome any help you might like to offer. If you are into cricket there is an event coming up in May. Hello Jan, thank you for your lovely comment. We would like to use this in an additional article we are doing to encourage people to make comments on our website. Your music was very fitting for the occasion of the Remembrance Service and also accompanying the many photographs in Derek’s story. While processing our articles, the music was played many times and I must say the more you hear it the more it grows on you. 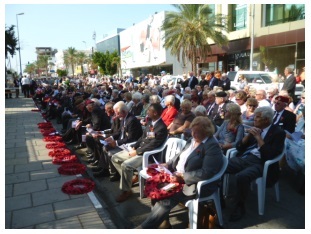 We were so pleased that RBL arranged for it to be played at the Remembrance Service in Kyrenia. If you get to visit Cyprus we would love to meet you. Regards Margaret and Chris.